I finally gave my Best Friend Jill her Christmas present!!! 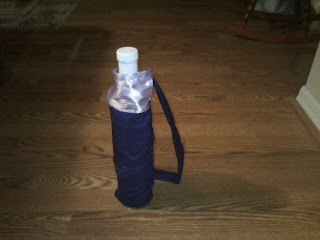 It is a wine bottle coozy!! The material I used it from her brides maids dresses from her wedding. I had extra material from when we made grab bags for an aniversary party for her and her husband. The bottle is actually (42below ) It is a product of New Zeland. It is named after the longitude. It took awhile to get this product, so it isn't completely my fault that I gave it to her late. I love you Jill!! I colored her hair purple last night. She is going to send me pictures of her hair so that I can post it and show you her pretty purple hair. She loves the color purple. Well I love the color green, I wonder if I could put some green streeks in my hair. That would be fun. But, I'm not sure Barry would like it , maybe if I did Camo colors he would like it. He is all about the Camo these days! !I love you honey!!! Today my family and i got to go in a simulator airplane. It was fun. Austin flew the plane and crashed it. Aidan almost made me sick by flying sideways. We were very lucky to get the opportunity to fly/ride in one. Yeah, my new merrells are here!! I just love them. Thank you barry! I love you! First, I wanted to show you what I am working on. These cute magic card wallets are what I am still working on for Christmas gifts. I know the time has passed, but I am still willing to get them done. They are easy and fun to make. You can pull on the ribbon and the card will come out. It's like magic. If you are in my family, one is coming your way. Next, I got a new cell phone for Christmas. Yea!!! However I have broken my last couple of phones so I wanted to make something for this phone to make it impossible for me to break. There is vinyl knitted in the front of this cozy. I can wear it around my neck and talk on it while it is still in the pouch. If I drop it it will still be hanging around my neck. The clear vinyl allows me to text and scroll through the screens. The size I made will fit Iphones and you can still move through the screens even though the vinyl is covering it. I will have to make more in all kinds of colors. Also, from my parents and me selling a pink knitted hat like my sisters I was able to buy this Denise Interchangable needle set. I already cast on my first project. This is the Art Yarn Beaded silk and sequins my mom bought me on vacation. I think of her and my Dad while I am knitting this yarn. I am making a hat from Knitty. It is called Duet . I love how this pattern can be either a scarf or a hat. I had a hard time with what to make with this yarn because it is so beautiful. Now I can have 2 projects in one. I am glad I waited to knit with this yarn and found this pattern. Check it out. Thank you Mom and Dad!!!!! and Me!!!! I wonder what else I will make using these needles!!! I am looking for shawl patterns. I may make this Heirloom shawl Check it out. I have some 100% Rayon yarn I may make one out of. Ravelry has a group that is making this shawl with a errata page. I guess people saw some mistakes in the pattern. I also saw Laura's shawl pattern I may make as well. Must get started. I am also finishing up my sister's new mittens. I hope these don't unravel on her. 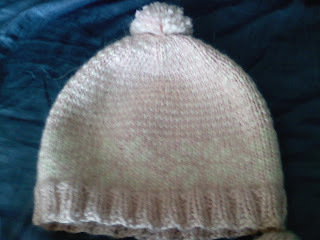 Here is a hat I knit for Krystin. I may knit one for me next. I love how warm it is. I also love how fast they are to knit up. I am going to look in my stash and try to make some hats out of my stash. I would like to go to Stitches South this year and I am sure they have yarn there. If I knit up the yarn I have, I could buy some more there. Hmmmm...... What project do I start on next? So exciting!!! 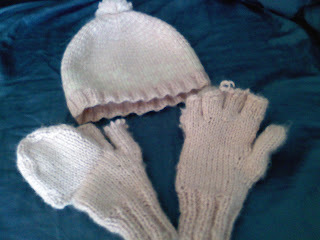 Here are the hat and gloves I made for my sister. Can you see where it is coming out? Ahhh. hold on little stitches please don't run too far. I am trying to make a new pair for her this week and I am going to make sure I weave in the tail really far. I know it is cold up there and I want to make sure her hands stay warm. Hang in there little gloves. These are the first pair I have ever knit. I was surprised at how fast they were to knit up. I love working with this yarn. I am going to have to make me a pair. It is Bernat Alpaca. The fair isle pattern makes the hat thicker, therefore it is warmer. Soon Cindy, they will be on their way to Minnesota. I love you!!!! I finished weaving this bag just in time for Christmas. Eli gave this bag to his wife for Christmas. He said she loved it. I really enjoyed making this bag. I also loved how the colors worked really well together. I have some leftover yarn from this project, so I am going to make a cell phone cozy for her as well. My friend Pat at work has been working on this cross stitch project over the last year. It is nearly finished. It is so beautiful. It's about 15"x 15" approx. I just love the colors. Awesome job Pat!!! So here is the only pic I have of my sisters gloves. These are the first pair I have ever made. I don't know what has happened to me lately. I haven't been taking pic of the items I have completed. 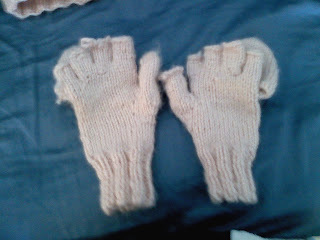 I finished these gloves, but forgot to take a pic of them. I also made a hat to go with it and forgot to take a pic of it. I am making another one, so maybe I'll remember to take a pic. I love how these gloves feel. It is made out of Alpaca yarn from Bernat. It wont felt because it has a small percent of acrylic in it. Cindy said she was in -19 degree weather and her hands didn't get cold. Maybe she can take a pic of them and send me it so that I can post them. Well I would post my Christmas presents I made this year, but I didn't get them done. Oops. Maybe I will get one done today? I better get to it then. Merry Christmas!!! !